Your trusted outdoor living builder for Leawood KS screened porches, sunrooms, decks, and more. 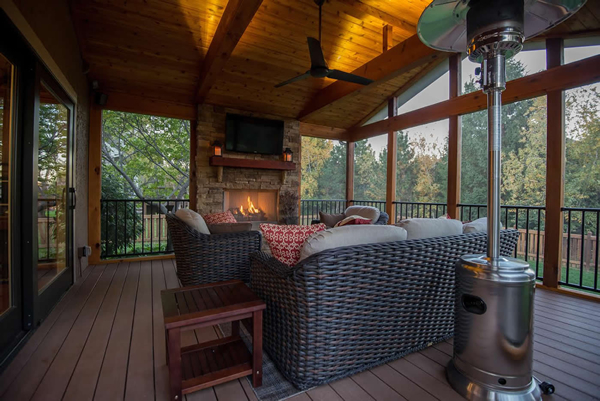 Archadeck of Kansas City been building custom Leawood KS decks and porches since 2001, and we aim to be your first choice in screened porch, outdoor fireplace, low-maintenance deck, and sunroom builder in Leawood, Kansas. As a trusted Leawood deck and porch builder, we can offer complete customization of your outdoor living space to integrate your new addition into the style and finish of your home and create stylish, comfortable living outdoors. We pride ourselves on designing and building truly usable Leawood outdoor living areas by utilizing preferred elements such as low-maintenance materials, outdoor fireplaces, and electrical capabilities to accommodate TVs, lighting, fans, and speakers. Our goal is to build custom outdoor spaces for the way you prefer to live outdoors. 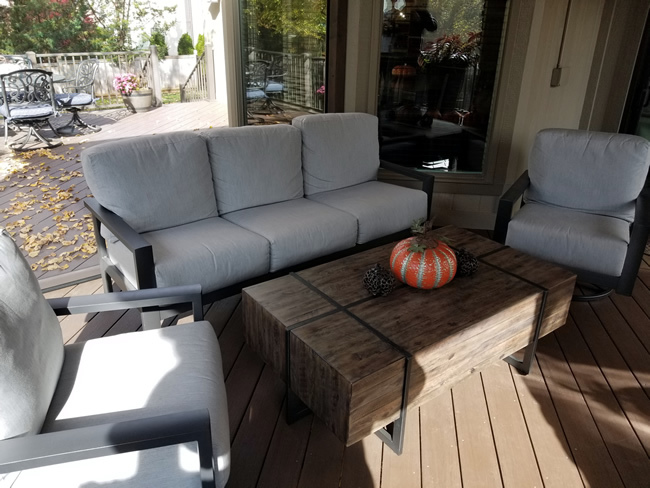 Call on Archadeck of Kansas City to help bring your ideal outdoor living space from concept to fruition. Take a look at these custom outdoor living areas in your area! 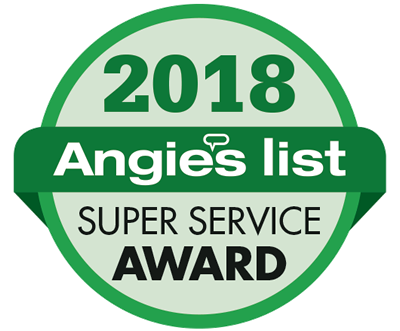 With an A+ rating by the Better Business Bureau, you can count on Archadeck of Kansas City to provide top-notch outdoor living building services. 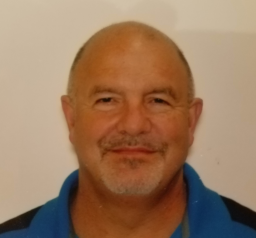 We are a name you can trust and one that you will recommend to family and friends. As a trusted screened porch builder, Archadeck of Kansas City can build a custom outdoor living space to accommodate your needs and lifestyle. In the screened porch in Leawood below, a tall gable roof will provide maximum airflow and light entry. The addition of a custom stone outdoor fireplace means that the space will remain comfortably warm and ambient on cooler days and evenings. Adding a space heater and ceiling fan will circulate warmth throughout the entire space. The AZEK low-maintenance flooring is a lovely complement to the porch and will keep the family enjoying their space for many years to come without the inconvenience of sanding, staining, sealing, or painting the porch floor periodically. Comfortable furnishings create a truly warm and inviting space for the homeowners and their guests. This custom screened porch in Leawood is awash with natural light by way of tall gable roof and extra wide screen openings. Low-profile pickets in black draw the eye beyond to the natural surroundings of the porch. A rustic stone outdoor fireplace will bring this Leawood family outdoors for more hours and in cooler temperatures. This large porch accommodates the placement of an additional heating source, a gas space heater, for even more time in this comfortable outdoor living space. This Leawood screened porch is the ideal space for family movie night or gathering for conversation with friends and family. The finished tongue and groove ceiling allowed for clean installation of electrical elements, such as lighting, fans, and speakers. As your trusted porch contractor, Archadeck of Kansas City can work to create an outdoor living space that matches the style of your home, with materials that will match or complement your home’s exterior finishes. 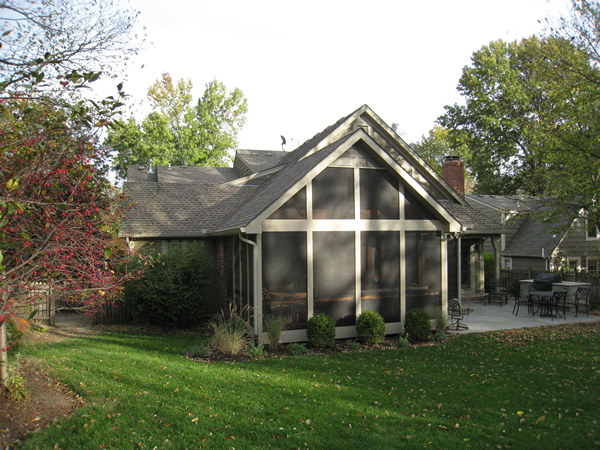 The custom Leawood screened porch below truly appears original to the existing home, because we were able to utilize framing, siding, and roofing that were a perfect match to the original materials. The new high gable roof of the porch creates a unique double gable façade for a stylish and custom look. Altogether, the flow of the entire outdoor living space is a very organic-looking, cohesive design. This inviting screened porch in Leawood, KS is the epitome of custom-designed-to-match outdoor living. The new gable roof of the porch boasts shingles that match those of the existing home. Notice the small area of shingles siding at the top of the porch gable – also a dead ringer for the original gable’s shingles. The porch trim is painted to match the existing home and window trim. The screened porch leads to an open-air patio, as well as a smaller covered patio area. The entire outdoor living design not only complements the original home, but also the large, natural backyard adorned with mature and flowering trees. What a lovely example of a private backyard getaway and gathering spot! Leawood Deck Builder: Leawood, KS deck re-design and build and screened porch addition. Imagine what your before and after photos will look like! 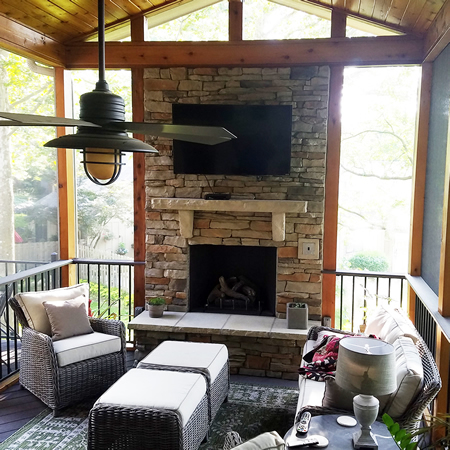 If your Leawood home has an aging outdoor living area, look to Archadeck of Kansas City, as your preferred deck builder, to bring it anew with a custom-designed deck, screened porch, sunroom, or a combination of spaces! This Leawood KS home’s deck required a total rejuvenation. What’s more, the family needed a more usable space. We turned their expansive aging deck into a brand new low-maintenance deck and screened porch outdoor living combination. Archadeck of Kansas City designed and built a new low-maintenance AZEK deck to replace their aging pressure-treated wood deck. The deck is large enough to provide a grilling area and eat-in space. The dark decking color and black aluminum railings work in perfect contrast to the home’s exterior color. The screened porch boasts framing that was painted to match the home. The raised deck and porch create an open space underneath that might be utilized to reinstall a flower garden, or even for storage of small outdoor tools or toys. You have to see this complete Leawood KS deck makeover to believe it! This aging Leawood, KS deck was transformed into a new low-maintenance deck and screened porch combination. Leawood Deck Contractor: Happy Holidays are Happier on a Leawood Screened Porch and Deck! These homeowners made their Leawood screened porch and deck even more beautiful with autumn holiday décor. As an extension of your home, a screened porch will allow you to express your own style during the holidays. If you are looking for a deck contractor, take a look at these custom deck designs by Archadeck of Kansas City. This beautiful Leawood deck and screened porch boasts diagonally-installed low-maintenance flooring for a truly custom feel. The expansive area accommodates two options for outdoor living – eating and relaxing or visiting with loved ones. These Leawood homeowners can choose to remain in the protected area of the screened porch, or to spend time on their open, sun-filled deck. The cool brown tone of the low-maintenance deck and porch floor play in perfect color harmony with the home’s window trim and siding color. Utilizing matching or complementary materials, we can create an outdoor living area that feels completely original to your home. As your trusted Leawood porch builder, Archadeck of Kansas City can offer customization of your outdoor space. 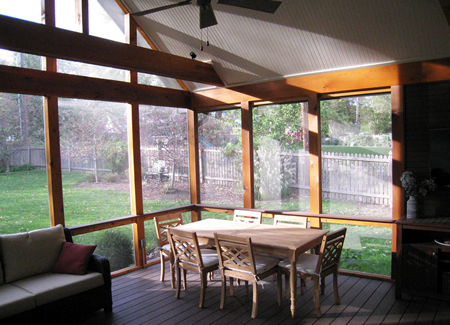 We can offer many customization options like the ones pictured below in this Leawood, KS screened porch. This porch was built to incorporate a high gable roof design that will bring lots of natural light inside the porch and inside the home by way of the original transom windows. Covered and screened porches don’t have to be dark spaces. High ceilings are not the only options for offering a bright space. 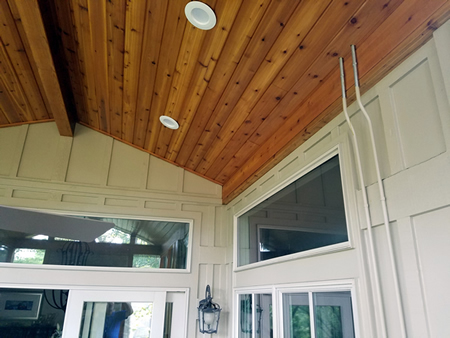 The homeowners customized this porch with a warm finished tongue and groove ceiling, which allowed us to hide unsightly electrical wiring used to light the space with recessed lighting. We matched the electrical conduit to the home’s exterior paint finish, effectively camouflaging it. Bringing electricity into the ceiling in your outdoor space means that you can add lighting, fans, speakers, and TVs to your covered porch or screened porch. Custom screened porch with tall gable roof, tongue and groove ceiling, and recessed lighting. This inviting screened porch in Leawood offers an intimate setting for relaxing or enjoying time with friends and family. The high gable roof allows light to freely enter the space, even from above the custom stone fireplace. The warmth of the cedar trim and tongue and groove ceiling helps to create a cozy feeling throughout the space. A decorative and functional ceiling fan will aid in warm air circulation in cool temperatures and help cool the space on warmer days. This Leawood, KS screened porch boasts a high gable roof, filling the space with natural light and fresh air. The finished white beadboard ceiling facilitates a clean, light, and airy feeling throughout the space. The warmth of the cedar trim works in perfect contrast to the darker AZEK synthetic flooring in Acacia and white ceiling. This screened porch is large enough to accommodate different living areas for eating and relaxing. This cozy Leawood screened porch offers the comfort and ambiance of a custom stone outdoor fireplace. Fireplaces on porches also give design opportunities for seasonal décor, as seen here decorated for Easter. Imagine adding twinkling Christmas lights and ornamentation to set a lovely holiday scene for watching Christmas movies while sipping hot cocoa by the warmth of the fireplace.